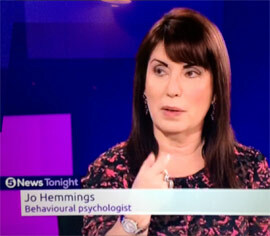 Jo is a regular Psychologist on ITV’s Good Morning Britain and This Morning as well as Channel 4, C5 and Sky News. As a member of the British Psychological Society (BPS) she also helps behind the scenes, in the contestant selection process, by giving psychological advice and assessment to reality TV producers and contestants both during the selection procedure and the series. Recent TV work includes working as an Assessment and Duty Of Care psychologist for a number of reality TV series and documentaries for all the leading channels, including the BBC’s Back In Time For The Factory (September, 2018) and This Is My Song (December, 2018). Radio work includes weekly slots on Talk Radio, BBC Radio 5 Live, LoveSport Radio and BBC Radio London. Here is her showreel and some recent TV clips. Are dating apps making us less picky? Jo Discusses Can You Be Too Old For Some Things?